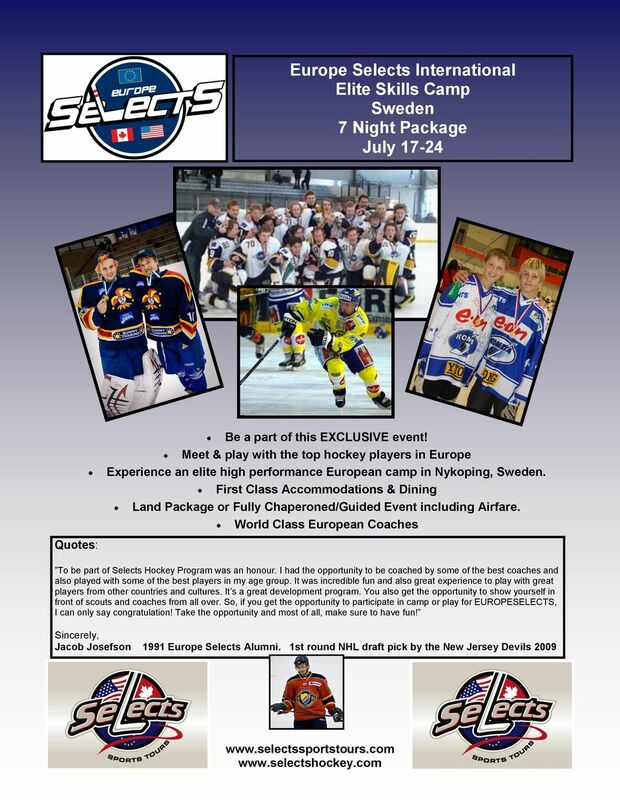 Download "Europe Selects International Elite Skills Camp Sweden 7 Night Package July 17-24"
3 Selects Hockey Camp Mission: Coaching: It s our intent to provide the best coaching available to our camp participants. Players will learn from coaches and guest players with experience from NHL, Swedish Elite league, Swedish J20 SuperElite, Russian League (Before KHL) and Finnish League. Our instructors will show tremendous dedication and passion for teaching top hockey players. Their attitude, preparation, and personal involvement with each player sets our camp apart from others. In-Depth & Positive Learning Environment: Players will practise different kinds of technique, game situations, have lectures, play 3 full games, review film, experience tough off-ice training, etc. Players are constantly learning at our camp. Players will also get a 1 on 1 review with an instructor in which players are expected to come prepared with questions in addition to hearing the camp instructors analysis of the players abilities. Competition: Players are pushed to perform and excel just as they would in a Top Junior Hockey, or Professional Hockey. Our intent is to develop the competitive mindset of the player and prepare them for these higher levels. Applicants will be getting high level competition. Councillors: Many of our councillors are Selects Hockey Alumni who are current playing at the highest Level of Junior Hockey in or North America. A great amount of emphasis is used in choosing our councillors, their significance as role models to these young players is paramount. They serve as a real life example of what is needed to succeed at higher levels and participants benefit by listening and creating a good friendship with them. Head Instructors: Magnus Ramstrom - Magnus is the Director of European Selects. He has coached highest level of junior and youth hockey in and Norway. In both countries he has been working with Player Development as his main focus. Magnus grew up playing his youth and part of his junior hockey in Stockholm area. At a young age he moved to Chicago to study and play hockey. He spent 13 years over there. During this time he played and started his coaching that he continued with in. Magnus has also taken several hockey courses. His hockey coaching experience has helped Selects Hockey in recruiting top Swedish and other European hockey players, and also in assisting our program in coordinating our European tours. Magnus has also worked as a amateur scout for International Scouting Services (ISS). Magnus is a veteran instructor of the Selects Hockey Elite Camps and has been behind the bench for several showcase championship teams in recent seasons. Johan Sundberg - Johan grew up playing elite hockey in the Stockholm area. After playing hockey, Johan started to take several management and leadership courses along with several hockey courses in. He has an MBA from Stockholm University. Johan has over 10 years of experience with coaching youth hockey and has had great success in winning tournaments and developing great players. He is well known and respected for his enthusiasm and his passion to help develop younger players. He has also worked at several hockey camps around the world, such as, Czech Rep., Russia, USA, and Canada. Johan has also helped Hockey Association during camps for the U16 National Team as well as helped educate coaches in the Stockholm District. Johan is also part of Selects Hockey coaching staff. Sergei Zak - Originally coming from Russia, Sergei Zak grew up and played his minor and junior hockey in SKA hockey club from Saint-Petersburg. After finishing High school in Russia, he moved over to Canada to play Junior A leagues in Alberta and Saskatchewan. After playing there for a couple of years he decided to move back to Russia and continue his professional carrier as a player in Russian Hockey Elite League (KHL, which stand for during these days). Sergei has been in Russian national team before age of 16 and then reactivated his international experiences playing for Israel national team for about 7 years, getting many MVPs prices during the world championships with that team. During his hockey carrier he has graduated Physical Culture Academia with a degree of hockey coach and sport teacher. Since 2001 has moved over to Iceland to take part in the Icelandic Ice Hockey development program. Currently Sergei Zak is a head coach for Björninn Ice Hockey Club in Reykjavik and Head coach for Iceland U18 National Team. 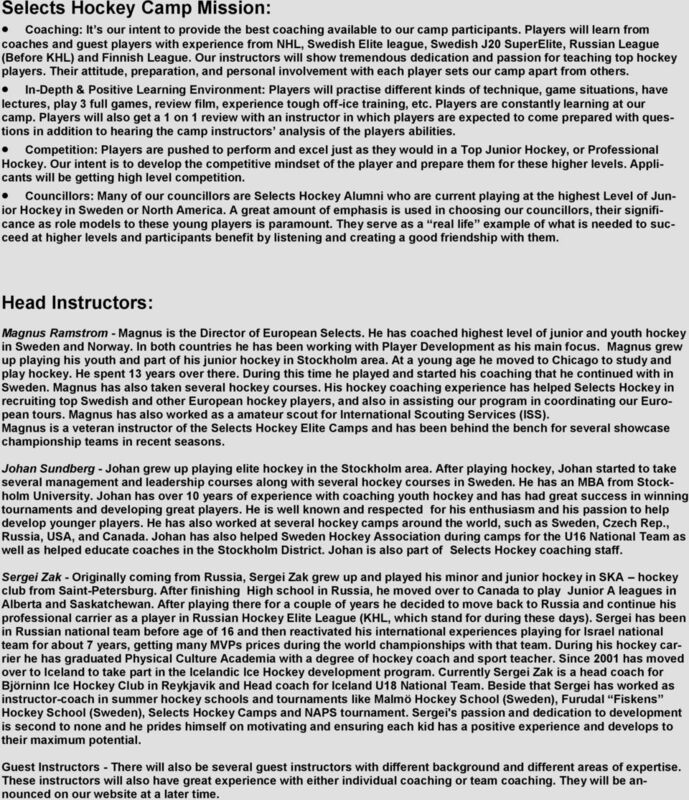 Beside that Sergei has worked as instructor-coach in summer hockey schools and tournaments like Malmö Hockey School (), Furudal Fiskens Hockey School (), Selects Hockey Camps and NAPS tournament. Sergei's passion and dedication to development is second to none and he prides himself on motivating and ensuring each kid has a positive experience and develops to their maximum potential. Guest Instructors - There will also be several guest instructors with different background and different areas of expertise. These instructors will also have great experience with either individual coaching or team coaching. They will be announced on our website at a later time. 4 DAY 1 / July 17 (overnight flight) Arrive in Stockholm, Custom Clearance in Stockholm Bus to Nykoping Check-in to Sunlight House Hotel DAY 2 / July 18 Free TIme Check in to Camp DAY 3 / July 19 Training Lecture * Sample itinerary. Specific meals, tours, events can be included if desired. 5 DAY 4 / July 20 Training Training Lecture DAY 5 / July 21 Training Lecture First game of Europe Selects Elite Camp DAY 6 / July 22 Traning Games 1 and 2 of Europe Selects Elite Camp * Sample itinerary. Specific meals, tours, events can be included if desired. 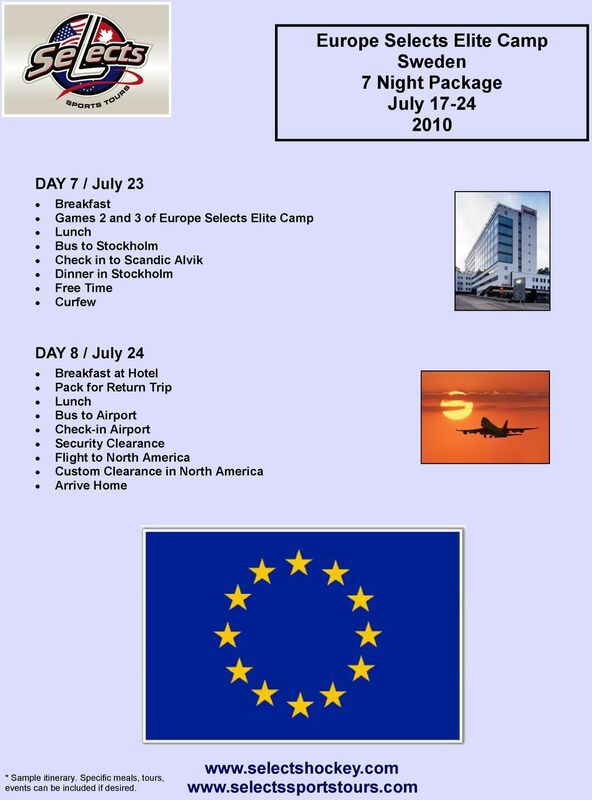 6 DAY 7 / July 23 Games 2 and 3 of Europe Selects Elite Camp Bus to Stockholm Check in to Scandic Alvik in Stockholm DAY 8 / July 24 at Hotel Pack for Return Trip Bus to Airport Check-in Airport Security Clearance Flight to North America Custom Clearance in North America Arrive Home * Sample itinerary. Specific meals, tours, events can be included if desired. Membership All memberships include the 30% F&B discount at Oubaai Hotel Golf and Spa. 1 f a football coach observes a prospective student-athlete's high school contest during a contact period, which of the following has been used? A) One evaluation for that prospective student-athlete. Practice Exam. 3 A Division II institution may make a four-year athletics scholarship offer to a prospective student-athlete. A) True. B) False. The Soccer Experience of a Lifetime! Playing College Soccer and the Recruiting Process Introduction To develop this guide, we surveyed experienced parents and players, Richmond Strikers staff and coaches from NCAA Division I, II and III programs. Wilcox Events - has teamed up with some of the world s best private golf clubs and sports people to create - The US MASTERS TOUR via Las Vegas. TOUR PROPOSAL If you have any Questions please contact us: facebook.com/eplsports.org twitter. Waukee Activities Department Parent/Athlete Handbook Mission Statement The mission of the Waukee Activities Department is to compliment and enrich our students in their pursuit of academic excellence. Club 63 North Current Activities Office hours: Monday - Friday 8:15am 4:15pm closed on ADO s 9911 MacDonald Ave. Phone: 790-6268 club63@syncrude. Congratulations on qualifying for the 2016 Annual Sales Convention at Fiesta Americana Grand Coral Beach Resort and Spa in Cancun, Mexico! Summer Skating School. Hoover Arena operated by Ice Land USA 15381 Royalton Road Strongsville, Ohio 44136 440-268-2800 www.icelandusa. +1 512 535 2517 Travel Itinerary for: Jonathan Snow (2 passengers) Page 1 Dear Jonathan, Thank you for contacting Personalized Travel Peru. Below you will find all the details of your trip, as requested.